Quality Assurance defines methods of avoiding defects in a system through proper planning, documentation, and making set of guidelines to assure the quality. Normally it is to be initiated at the beginning of the project to bring out the guidelines based on the software specifications or company product specifications. The outcome consists of quality plans, inspections methods to be used, test plans, a proper defect tracking system, and finally training people to achieve that. In other words, it is a management practice that is initiated to get best level of quality. The candidate must be well versed in communications for this job profile. As quality assurance engineers are required for wide range of industries from automobiles and electronic industries to food and textiles, the skill level of quality assurance engineers varies according to the field of work. But having a look at the typical quality assurance engineer questions you could know the prospects in each industry. 1) Being in quality assurance, can you indicate the quality management practices that was followed? You must be able to describe the Management system that you have been trained in. Most industries do get certification to ISO 9001:2008. Hence, the Quality Assurance Engineer must have attended Internal Auditor training programme or even Lead Auditor training programme. The quality management systems training provides in depth understanding of the principles of maintaining quality and ways to follow them to avoid defects. Besides that, you will need to mention briefly about how you know to use standard operation instructions and internal procedures. This will show employers that you are following a set of procedures that is made available anytime. Also indicating about Six Sigma training will be added advantage if you had any. 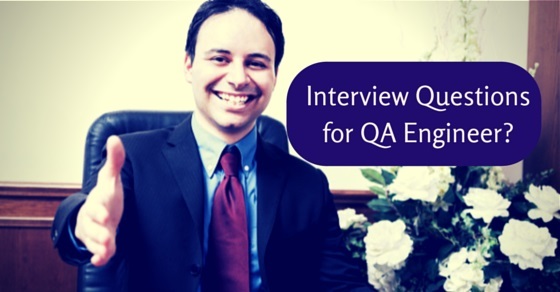 2) What were your roles and responsibilities as Quality Assurance Engineer? For this you would have to brief on the main roles that relates to planning and executing the tests systematically required for detecting defects. You need to mainly focus on the how you were involved in developing the procedures and define the way the procedures were carried down to the process cycle. Also elaborate what monitoring methodology were utilized to ensure that the products or services were fit for customer. This could be conducting audits or reviews. From the various activities that you describe, the employer would be able to visualize the quality system that you worked with. To fit to different industries, the word ‘product’ can be replaced with ‘software’ ‘service’, etc. Besides this you can brief on the improvement processes that you were involved with, quality related staff trainings, and quality related customer services that had handled. You can give examples of the problem solving sessions that you involved and how it was able to correct or improve a process. 3) How are your interactions with customers and how do you handle customer complaints? A Quality Assurance Engineer is involved during a marketing meet between the customer and organization. From here starts the main business requirements that is being input in the system or process back at organization. The system would then identify the needs which is converted to procedures and plans. The product or service is finally dispatched to the customer. In case of complaints, the Quality assurance Engineer comes to picture to tackle the issue and bring about the corrective actions then. This would become a preventive action plan for the future. By briefly describing about some interesting problems that you would have faced you could bring out the way it was handled and what steps you had taken to implement the corrective and preventive actions. 4) Were you involved in training for your staff on aspects related to quality? How did you go about the process of quality training for your staff? Training is a critical aspect in quality management system as everyone would be required to follow certain pattern or procedure to execute tasks. This is required to ensure that processes don’t falter or deviate. For getting the intended results it is imperative to execute the procedure as given. The main responsibility of quality assurance engineer is to ensure that the people working at the specified process unit are aware about the deviations that might arise and how to cope with it. For this he/she would need to train them or get them the necessary on the job and off the job training . If you had been involved in this process, then its best to describe the specific training and your accomplishments within the group. You could even explain with suitable examples. 5) In your point of view what else is important for maintaining the quality of the products? Quality assurance itself means maintaining quality using various techniques like auditing and reviewing the process. By having a systematic pattern for conducting audits it is possible to review the process and review for any improvements. This process basically involves data collection as well as monitoring of production process. From here, it leads to a continuous improvement within the process which helps to simplify the methods. You could describe how you conduct audits and which way do you notify the process owners about the changes. You can also describe what methods you employed to collect information and monitor the process. Make special mention of the problems that were highlighted, corrections that you initiated, procedures amended to facilitate the process and improvements projected in quality system. 6) Were you part of a team? If yes how were your team playing skills beneficial? In one sentence – Quality assurance Engineer role is to be co-ordinating between the organizations and the customer. His /Her role is significant in being a link between various team members of different departments of the organization. In fact, they need to interact from the lower level to the highest level of the organization, and even interacting with customers. Being in such a position, it is very much required to be a good team player. For this the main skill required is effective communication skill and tolerance. Make a brief description of the specific project where you had to use your communications skills and lead a team. Also you could highlight your day to day communications with quality control team, quality managers, quality assurance team, production team, maintenance team, technical team, Marketing team, product development team and the top level management. 7) If you were to describe about your strengths, what would you say? Most of the companies do want to know about the best qualities in you. Hence, first you need to identify what you are good at with respect to knowledge, experience, skill and abilities. Make a note of them and prepare before you attend interview. Prepare a list of all your abilities or which you are strong at. Try to match them with the recruitment requirement. This is to know which quality is mainly required for the employer. When this questions is posed, you could easily describe them without missing out the important ones. 8) Could you indicate whether you had conflicting priorities and how you scheduled your quality assurance activities accordingly? As quality assurance you would have been involved in priorities that would have conflicted with your activities. Then indicate or highlight with example how you managed to set priorities, defined objectives and allocation of resources for the activity to be done. A simple example could be the auditing that was planned. 9) What methods did you employ to ensure that no details are forgotten for ensuring effectiveness of corrective action? This aspect is important for handling role of quality assurance as you would need to see through details as well. Describe in brief on the ways or techniques you had used to monitor all the aspects of the process, precisely check for the gaps if any, ways you had employed to maintain vigilance and incorporate procedures for maintaining it. Here you would have to emphasize on the trailing audit that you conducted to be sure about the effectiveness. 10) Explain about a complicated problem that you had recently handled. What methods and tools did you utilize to manage the situation? You are aware that quality assurance engineer would need to gather data and analyse. Highlight on your ability to collect or gather data on the issue that were confronted with. Indicate the various audit methods you employed and how involved the various team members to participate in a brain storming session. After that you will need to describe ways you employed to decipher that information to bring to the attention of the management. Indicate the use of communication skills and important soft skills that you utilised to bring out the problem to the forefront of the team members. Besides that you would have even suggested the ways to combat the issue and devised corrective steps as well as preventive measures to ensure it doesn’t happen again. The quality assurance function or job in an organisation is critical to the management to ensure that products or services are delivered on time with no defects to the customer as per customer’s requirement. Hence, the interview for this profile explores the competencies and the qualities of the quality assurance professional. What employers look for are ability to plan, organize and initiate problem assessment utilizing proper analysing tools, take appropriate decision, be precise in the details and effective communication skill.